The money pit – part two. The other day I wrote a post on YE OLDE MONEY PIT, and my pal Curly requested photos. So I went to work. 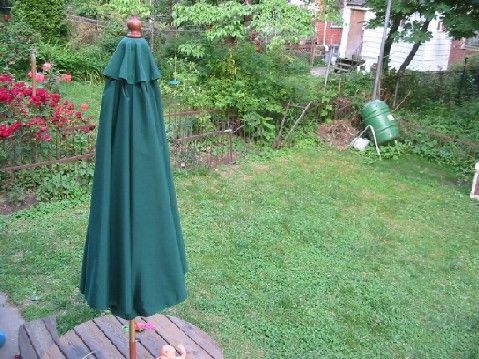 I would have preferred sharing pictures with better perspective, but as our palatial West Philly estate is really only a *twin* and only yay deep, I did what I could. SO… for all you housey types out there, BEHOLD, a post for YOU. Some background. 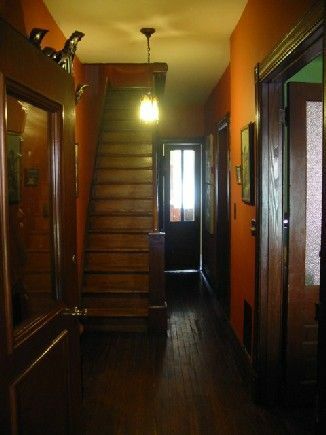 We live in an old house (100 years) which had been semi-converted to accommodate rental – 1st/2nd floor as a single unit and the 3rd floor as another. 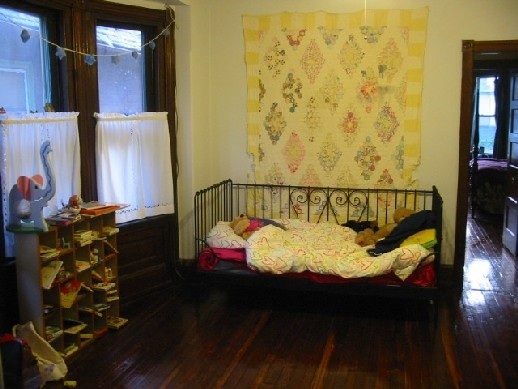 The previous owner had removed doorways from the 2nd and 3rd floors, apart from those at either end. My husband rectified the situation by sledge-hammering his way through the walls on the 2nd floor opening up the previously-enclosed doorways. And there you have it. 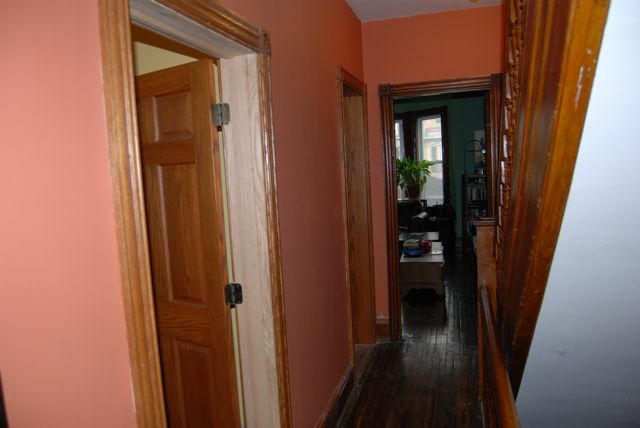 Here is the 2nd floor hallway. It used to be a solid straight wall on the left where there are now 2 DOORS. YAY! My younger daughter’s room. We still have to finish the baseboard and above the door where the electricians had to rewire, but otherwise done. 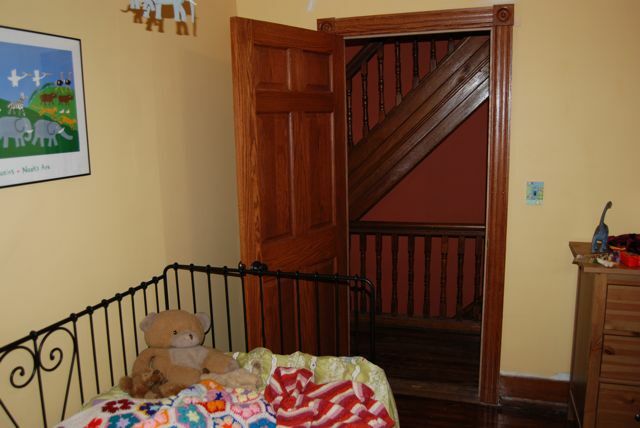 The wall on the left (the shadow behind the door) used to house the old doorway to the bath. This is what it looked like before. You can see the doorway in the corner, looking straight through to the front of the house. 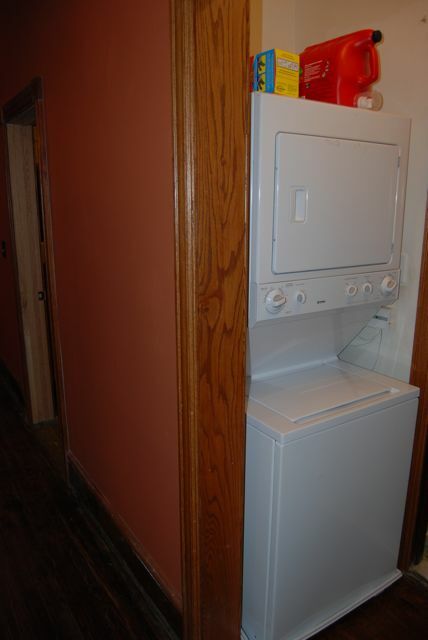 Our new washer/dryer unit sits in the newly-formed alcove next to the bathroom. Previously I had to haul everything up & down 3 flights to the basement. The new set up brings convenience. Plus, it seems to be warming the upper part of the house (at least psychologically) and makes the whole 3rd floor smell fresh. The BIG DOWNSIDE: The washer uses a lot of water. When this water drains, it has only one means of escape. The pipe is too small to drain quickly, so the water backs up into the tub, leaving a filthy layer of lint, dirt & repulsive residue behind. Since my 2 kids need a bath at least occasionally, I am now forced to wipe up after my laundry. So, in short, my machine cleans my clothes, BUT now I must clean up after my machine. IS THIS BETTER? Time will tell. WELL.. at least it is fun showing off my house. 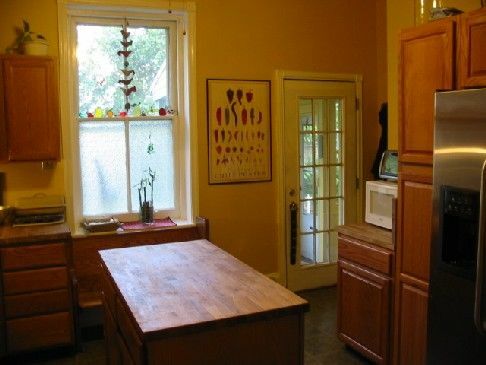 You really should love your house when you have dumped as much money into it as we have. And we really do love ours. Since you are here, would you like to see more? Okay. BUT please wipe your feet because you KNOW how I feel about cleaning. Gracias! The house looks a little different now. These photos are from 2006. That’s when I went temporarily insane and decided we were going to move. I do not know why, but I think that’s why they call it going insane. So I took a whole lot of pictures for the MLS and we put our house on the market. I think it went well because we got a full-price offer within 48 hours. But then I changed my mind and took it off the market again a day later. Why? I am still not sure. but I think that’s why they call it going insane. This is a picture of the front of my house. It looks very pretty. We don’t have those ewe bushes anymore b/c my husband hated them and tore them out. In fact, he tore almost everything out, so now our front yard looks like a dirt pit. At least that’s what the neighbors tell me. 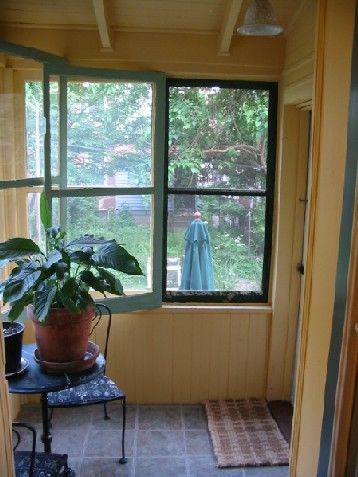 Also, our house used to have a lot of chipped & hanging-off paint. 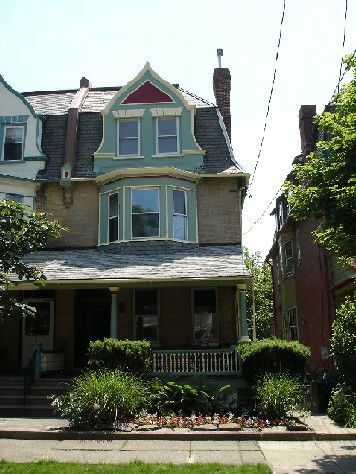 It was voted second-ugliest house on the block. So once we saved up enough money, we paid my brother-in-law to paint it. He did a very nice job. Unfortunately he is not yet desperate enough to install our insulation. Hopefully he will be one day soon. This is what I see when I walk through my front door. What you would likely see would be teeth, those of our enormous 150 lb dog who likes to say HELLO and make sure you are friendly. He may hump you if he likes you a lot. And BOY did he really like one of our plumbers last week. We tease him that he is our ‘big gay dog’. But he also likes women, like my sister, so I guess he is our ‘big Bi dog’. You must be o-kay with that. Did you bring me my Dutch oven? Yes, you do look nice. But please stop admiring yourself, we have more rooms to see. OH! You’re just staring AT the mirror – sorry, I thought you were just being vain. Yes, it is lovely, isn’t it. It’s the reason we bought the house. No seriously. 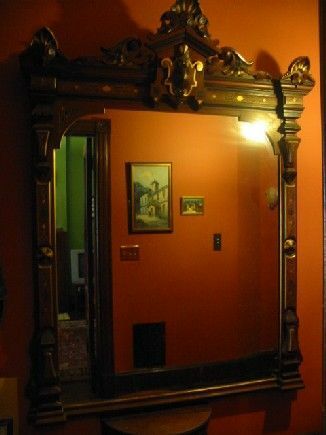 The House itself, well – it’s really just a place to hang the mirror. 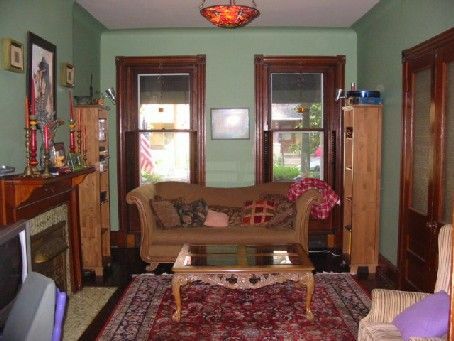 Okay, through the double doors to your right, here’s the living room. We don’t have that couch anymore – we actually gave it to some friends and it looks better in their house. They have a couch that’s almost identical and they look really nice together. In addition, they have only one kid and NO dogs – WELL – technically they will have 2 kids soon, as my friend is almost 40 weeks pregnant. She is giving birth at home by the way, but I do not think on the couch. Anyway, we have (as you know) 2 kids and 1 dog. Our big dog used to like sleeping on that couch more than life itself. I know it sounds awful that we took that pleasure away from him, but you see it was not a cheap couch from the thrift shoppe. It was an expensive couch that we bought for a LOW LOW price at the Outlet. But he also started doing THINGS to it – sort of unspeakable things, and so we gave it away before we had to throw it away, if you know what I mean. I miss that couch. It was such a nice looking couch. I am glad it is at my friend’s house. I will be over there this weekend, and I will make sure I remember to sit on it. Ahhhh. and Here we are in the dining room. We like food, so we of course dine a lot in here. Our big dog sleeps in the corner too, so watch out for his toys. He may try to use you as one if you get too close. OOOPS! Sorry, my mistake. Just threw that one in to make sure you weren’t sleeping -WAKE UP! 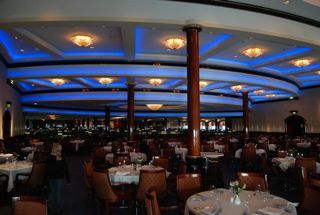 That’s the dining room from the cruise ship. 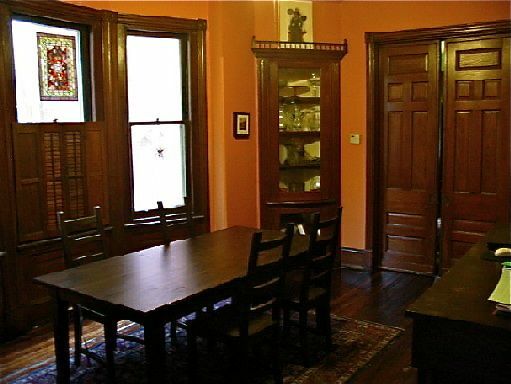 Here’s OUR dining room. Not quite so spacious, but it’s home. WATCH THE DOG. Ohhh, okay – no problem, right through that door. I’ll wait for you in the kitchen. and let yourself out the back door. It IS nice out here. WHAT? OH yes, I HAD completely forgotten that it’s a dirt pit out there right now too. AND that it’s 20 degrees, with an inch of ice on the ground. OH WELL. So sorry ’bout that. A girl can dream after all…. Hey, pass me that wine, won’t you? HEY! Taking a quick break in my hellish day of CLEANING to check email. UGH>I hate cleaning. Want to talk about the washer backup problem? It wasn’t clear from your post. Is the machine discharging into the bathtub or is the water coming up through the drain? If its the latter – I cant imagine the drain, down stream, from the tub to be so small that it backs up when used for the washer. Something is very wrong. Possibility one – Indeed a too small drain was installed. This would be hard to do without deliberate forethought. Possibility two – A clog. Something is blocking the drain line downstream from the tub and the washer. Likely the pipe makes a bend and heads down. I suspect something is stuck in there. Possibility three – Something else. It is an old house. The bath in question didn’t exist when it was built. Could be anything but I would bet its number two. It should be fixable. Drano won’t likely cut it but it would be worth a try. If it is really number one – Re-plumb. A 2″ line should be plenty big enough. 3″ better. It might be worth having a plumber, with a pipe inspection camera, so some snooping. If he has the camera he would also be equipped to fix the problem. If you want some help further troubleshooting feel free to contact us on our blog/podcast at http://www.handyguyspodcast.com/ We’ll be glad to try and help further. Boy Handyguys, you sure ARE handy. Thanks for detailing all of that for me! I am a little slow when it comes to these home improvement things, and your advice is very much appreciated. When I cleaned the house Weds. it dawned on me that perhaps – just perhaps – the tub was filling up b/c I wasn’t leaving the new screw-up plug DOWN. YES. I am going to try running the thing this morning and see if that doesn’t just do the trick & keep the water from percolating up. If it does not, then I will indeed be giving you a shout-out. Thanks for the compliment. We are trolling and posting on various blogs to try and get the word out about our blog. Thats how things work in the blogosphere right? We hope to get more reader/listener questions to talk about in the podcast. We hope this becomes a profitable venture via advertising revenue and commissions from our Amazon store partnership. In our next weeks episode we talk abut first tools for a homeowner or really essential tools for home toolbox. You should NOT need to put in the drain plug in the tub to prevent a backup. I cant post a picture here but envision a letter Y. The Y is your drains. One arm of the top of the Y is your washer. The other arm is the tub. You have a blockage, or constriction, on the lower leg part of the Y. When water comes from the washer it cant get out the bottom as fast as its coming in and runs up the other arm, into your tub. If you completely block of the tub arm of the Y you might risk water filling up the other arm of the Y and overflowing. Keep an eye on things if you do try the stopper. Your tub may actually be preventing a flood disaster. Good luck and feel free to post your question over at our site. (We have a call-in phone number too) and I promise we will discuss your issue on a future show. Thanks again Handyguys. I just checked out your site and it looks terrific. I will definitely post questions as they arise. Have been speaking with my husband this morning about the washer situation. 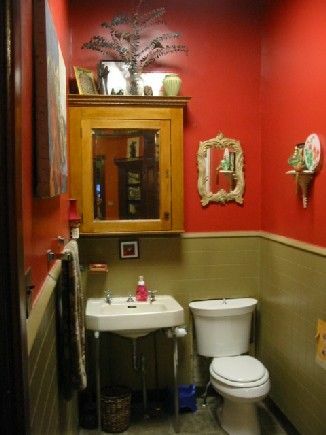 He tells me that the plumber – rather than install a new pipe exclusively for the washer from the 2nd floor to the basement (which of course would have entailed a LOT more work and expense), ran a line off the existing tub drain pipe to the washer. I am imagining this must be similar to the Y you’ve described above. Our tub drains verrrrrry slowly after a bath, so now our washer must be doing the same thing, plus backing up into the tub. I did not try to run the thing yesterday with the plug in – and I am glad I didn’t – now having read your recommendation against it. My husband suggests just using it as is, and hosing down the tub between loads. Not ideal, but I guess it’s either that or not use it at all. BAHHAHAHAHA!! I love that couch and am now really glad we cleaned it before lounging all over it. You didn’t mention Macx’s other adventures on the couch when you gave it to us. I almost spit up my cereal when I was reading your blog-I laughed so hard. Thanks for the memories. I love you! !